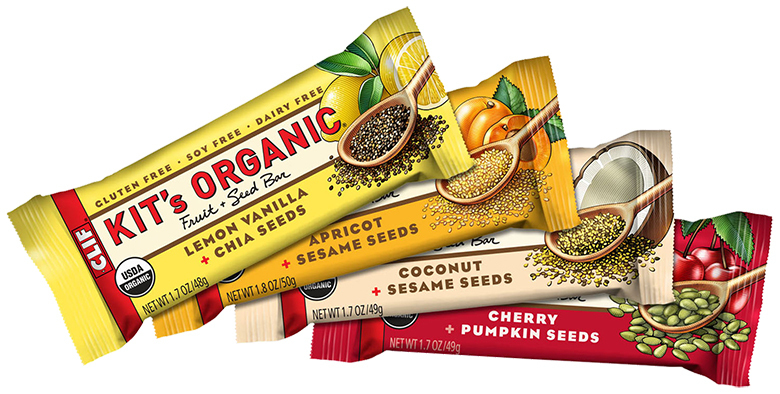 Win Kit’s Organic™ Fruit + Seed Snack Bars! 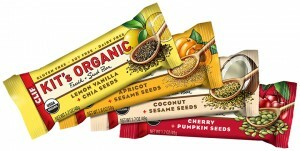 Win Kit’s Organic Fruit + Seed Snack Bars! Snack happy and healthy by entering to win Kit’s Organic Fruit + Seed snack bars! Whether you need a mid-morning nosh or an afternoon pick-me-up, when hunger strikes, you want to have a smart snack option, like Kit’s Organic Fruit + Seed bars! Kit’s bars are from Kit Crawford, owner and co-chief visionary officer of Clif Bar & Company. As a leader of Seed Matters, Kit works to improve and protect organic seeds. We know that much of our food supply has been affected by pesticides, genetic modification and environmental toxins. By saving organic seeds, we can ensure an adequate supply of nutritious and productive crops. You can find CLIF Kit’s Organic Fruit + Seed bars in natural food stores and at ClifBar.com for $1.59 per bar. “Like” Appetite For Health on Facebook and also “Like” CLIF on Facebook. Tell us what some of your favorite healthy go-to snacks are. Entries accepted until midnight EST, Wednesday May 14, 2014. Remember to check back here to see if you won! Almonds, greek yogurt and honey, apple slices with cinnamon! I subscribe to the e-newsletter, Like Appetite for Health and Clif Bar on Facebook. My favorite healthy go-to snacks are are fresh fruit and string cheese. I keep carrots and celery sticks in the frig, sliced and ready to go. almonds with dark chocolate and dried fruit! Some of my favorite healthy snacks are pretzels, organic fruit smoothies, walnuts and almonds, fresh veggies with hummus, and greek yogurt with honey drizzled on top. Pistacchios, bananas. hummus and crackers. Thanks for the great giveaways! Nuts, seeds, fruit, health bars. And once in a while I’ll have potato chips, the healthier kind. That’s my weakness. I like nuts and fresh fruit. I like air-popped popcorn, as well as fruits and nuts. I don’t buy sweets at my house. Everywhere we go we pack tons of fresh cut up fruits and vegies. My kids got used to it since they were very small. It works for us and everyone is happy! These bars look so delicious!!! Great flavor combinations! Will have to look for them in the store.Would love to win!!! Shared this giveaway on my FB and liked!Good luck everyone. Almonds, sunflower seeds, apples, grapefruit , Asian pears. Cashews, hazelnuts, apples, bananas, grapes and strawberries are my favorite healthy snacks….all in moderation, of course! A handful of walnuts and jumbo raisins. I love peanut butter and Johnathan apples! I like cheese sticks! YUM! CLIF bars are one of my favorite go to snacks! CLIF Bars and homemade trail mix. This gives me energy and is healthy too!! I eat a lot of larabars! Dates stuffed with almonds, peanut butter and date balls and lots of bananas. I subscribed to E-Newsletter, I like Appetite For Heal and Clif Bars. My on-the-go snack is: hard boiked eggs, light tuna packs with wheat crackers, small mango or granola bar or mixed nuts. My Favorite snacks to go is the homemade granola – very little sugar and so filling! I could eat celery and almonds all day long. I love pistachios, string cheese, Kind bars, apples, any kind of berry, or lately turkey jerky for snacks. The winners of this prize include: Meiko, Eliza E, Mai C, Heather and Roxana S. You’ll receive an email from us directly to claim your prize.